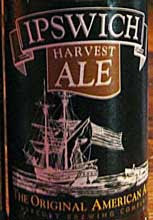 This one is the fall seasonal for the Ipswich Ale line of beers. The Ipswich Harvest Ale tastes like a combination of an IPA and a malty octoberfest-type beer. Interesting concept, but overall, the hop flavor washes out everything else. Going into the glass, the chestnut brown color is inviting and enticing. The cloudy consistency helps to give this beer an earthy quality. Nothing is terribly prominent in the aroma, but hints of hops are certainly evident. The beginning of a sip of this beer tastes of sweetness and malt, and brings in the earthy sensation. But the heavily hopped finish drowns out everything and imparts a solid, astringent hop flavor to the beer. Solid beer from a good brewery. Definitely give Ipswich a try if you have a chance.